ipv6 GRE | CCIE, the beginning! By definition, GRE is used to encapsulate IP/non-IP protocols into IPv4/IPv6, in the following lab we will encapsulate IPv6 into IPv4, so the outer packet has IPv4/6 source and destination addresses and the inner packet GRE, has IPv6 source and destination addresses (figure 1). Figure 2 depicts the lab topology in which 3 sites: North, East, and West are isolated IPv6 sites and connected with each other over an IPv4 network with their respective border routers (dual-stack). Each site establishes a FR point-to-point PVC to the other two with IPv4 as the network layer. – Planning the address scheme. 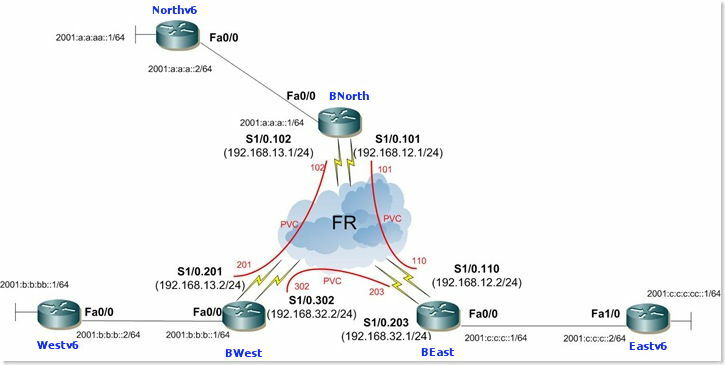 The configuration for point-to-point FR is very simple. Configure the ip address and the local DLCI, no need for neither inverse ARP nor static mapping as there is only one DLCI in the other side of the PVC. It is a point-to-point tunnel, so the tunnel source and destination are pre-configured, the logical topology is illustrated in figure3. 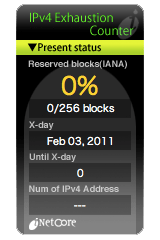 For each destination site IPv6 traffic takes the corresponding tunnel and is encapsulated into a packet with that tunnel source and destination.